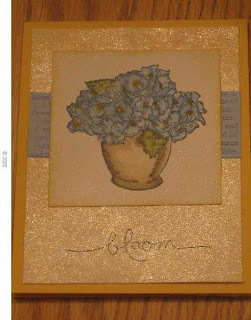 Over at Splitcoaststampers, there is a challenge where a Featured Stamper is chosen, and you find a card that inspires you (or, you are dying to CASE), and you change 3 things about it and make one of your own. 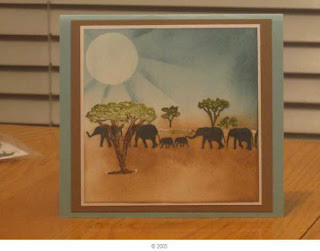 This week, the Featured Stamper is Nancy Ruth- and she has pages and pages of wonderful cards to CASE. I only went through 10 pages of her gallery, but picked this card to CASE. I made it two colors (and this is called Scene Silhouettes over at the Technique Junkies). I used Blue Bliss and Ballet Blue on the top, and Mellow Moss and Old Olive on the bottom. Stamped the trees in black. The moon was made by punching out a circle out of a post it note, including the sticky part, and placing it on the paper before doing any brayering. I added stickles to the moon for a little sparkle. The lace is called Netting Lace, and it is available in America, but I get it from Judith Adams at the Status Thimble in Australia at the Annual Smocking Arts Guild of America convention/market. Doesn't it make you think of Grandma's??? Remember when brayering on color, it goes on the smoothest on coated paper like Stampin Up Whisper White- save your Georgia Pacific for your Copics! Creamy Carmel CS for the base. I have the image from SU Holy Triptych on Whisper White CS. I used SU markers and the Aquapainter to color in the image- with a tad of stickles on the yellow star and the halos. Markers used: Blush Blossom, Ruby Red, Yo Yo Yellow, Blue Bliss, Ballet Blue, Creamy Carmel, Going Gray, Close to Cocoa. I took Creamy Carmel CS, swiped the CC ink pad over it, next I swiped the Close to Cocoa ink pad over it, then the Choc Chip ink pad. Finally, I swiped the Whisper White Craft ink pad over the top. I ran it through the Big Shot and highlighted the raised areas with Close to Cocoa ink. The turorial for this is on SCS and it is called Faux Wood Frame I centered the image, then added 2 straight strips to the outside edges- they are 1 1/4 inches wide each. Then, I cut out two toppers for the top- the bottom one is 2 3/4 inches from the top and at the center tip-3/4" from the center top. Next, I cut out a second topper measuring 2 3/8" on the outsides, and at the center tip 9/16" and this top 'layer' topper is applied with dimensionals. I took Creamy Carmel CS, and ran my ink pad over it and cut it in small strips ~ 1/8" each and ran them through the crimper. I cut random small pieces and glued them down for a 'hay' look, and then bundled 3 groups with DMC 610 to complete the sketch challenge. I am making 8 of these tonight, and now have only about 80- Christmas cards to go! 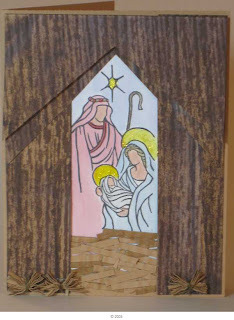 I want to make Christian/Nativity themed cards this year, so I am getting busy now! Thanks for stopping by! Your comments are greatly appreciated! 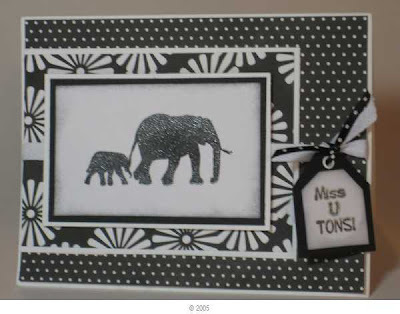 I recently had a Stampin Up Demo laugh when I told her that I was making a card with a 'theme'. That struck her fancy- "So, you have- homework"? she asked me? Well, I guess you could look at it that way, I like to think it is a challenge and a push for inspiration to learn and grow in my stamping abilities. This card has stretched me in many ways- it is my first Tri Shutter card, I never use DSP until recently and very rarely use buttons! Using the Tri Shutter card was my own idea, but buttons and DSP are the two challenges I took on this week. The instructions for the Tri-Shutter are from a SCS Technique Challenge click here for the link for the instructions. One of my daughter's dearest friends has a cat- Cookie. (Cookie is 5). My friend is highly allergic, but cookie is hypoallergenic. 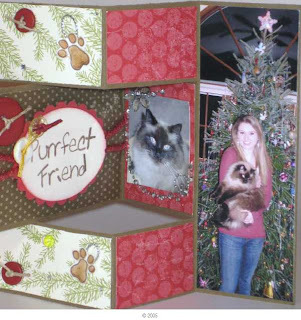 Anyway, I am making this card for Kristy-who is 16 and is pictured in front of the Christmas Tree last year with her cat. I used SU DSP The Write Stuff and Merry Moments. I love the Soft Suede and Ruby Red color combination. I used Copic markers to color in my image, a set by Firecracker Designs by Pamela called Hello Kitty. For the girls hair, I used Y21 and Y26. For her skin, I used E000, E00 and R20. For her shirt, I used R24 and R59. For the kitty, I used E31 AND 33, then dabbed on E27 and blended it in with E31. Finally, I added a touch of Y13 for the kitty's eyes. I stamped the paw image on vanilla CS (SU) and colored them in E31 and E33, and covered them with Crystal effects. I added some Bling it (Basic Grey) around the cat and on the girls hair tie and for her earring. I added Bling it, Dew Drops and Buttons for faux ornaments-trying to mimic the picture on the Rt-added silver cording on the paws (for hangers) and added buttons with retired SU cording through them. I also took white yarn and put it in a bowl with a touch of H2O and some Ruby red reinker for the cording that is holding the sentiment. I don't think I forgot anything........ The nice think about making a card for Kristy, is that she has an interest in the paper arts (unlike my daughters), so I know she will keep and appreciate this card! for visuals when coloring my image. I also found a link on SCS a while ago that I have printed out that correlated the Copic markers to SU cardstock colors- that is an awesome reference when coloring and blending. Thanks for looking- hope you enjoyed my Tri Shutter card. 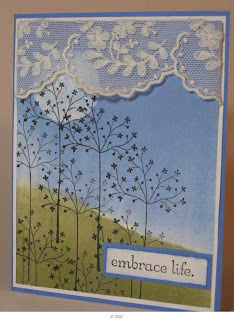 For my Sweet Dreamers Blog Group Challenge #8, we are to create a card with the theme Ebony and Ivory. Can you believe I have NEVER made a black and White card before??? I think the soldiers will like this card- they do not pay postage from Iraq to mail letters home. I hope it will warm someone's heart! FCD Blog Hop -Greetings and Salutations! 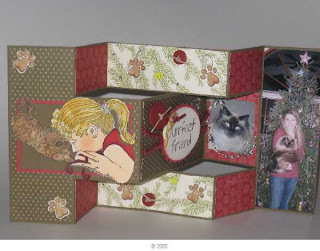 Welcome to the first Firecracker Designs By Pamela Blog Hop for Design Team 04! This month's theme is "Greetings & Salutations." We were asked to create any piece of art using our FCD monthly set that focused on this theme. The official start time of this Hop is Friday, September 18, at 8:00 AM (EST). If you arrived early, please be patient as all the links may not be live yet. 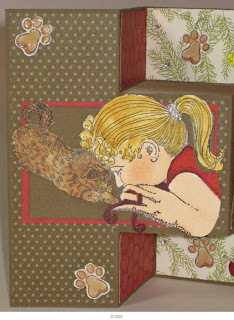 My sweet set is this little girl and her kitty, and includes sentiments, Hello, Purrfect , Friend, a ball of yarn and a footprint. I have been having fun with this set- for the blog hop, I used my Stampin Up markers and an Aqua painter using a technique called marker watercolor. I stamped the image on watercolor paper with Memento Tuxedo Black ink. I tried Flower Soft for the first time on this card on the little girls Pony Tail holder. It is so simple and easy to apply! I ordered the Floral Bouquet Sampler-which has 7 jars of flower soft included. For my card layout, I used a tutorial from the Technique of the week on Splitcoaststampers called Recessed Window Frame . I altered the size of the opening to fit the stamp by using the measurements in the post, and just making the middle opening the size of the opening I needed. I drew a line corner to corner (top left to bottom right, and top right to bottom left), drew in the 2nd line outside of the (picture) opening line and cut slits on the lines. (Gardendiva has pictures from Feb 2 if you need visuals- here is a picture of the cuts required). 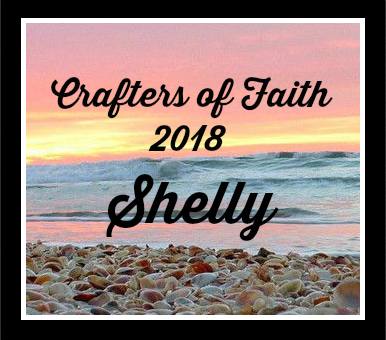 This is a “circular blog hop” where the only beginning is wherever you start!! You will know you are at the end of your blog hop when you’ve come back to the blog you’ve started from! (It’s not a huge circle…so it should be easy to remember where you started.). Please leave messages on the blog posts- you may WIN a prize Pamela is offering on a "Mystery Hostess" blog. The winner will be chosen from a mystery blog hostess that will be announced when the hop is over…so that’s why you’ll want to leave a comment on EVERY blog, so you don’t miss out! Now, to continue the circle, you will need to hop on over to Tesa's blog and keep going until you’ve come back to where you’ve started! Thanks so much for playing along with us and we hope you have a great time! It's the season for Cross Country! And, I needed to make some Thanks You cards for parents on the Cross Country team.... Last Saturday, my daughter suffered from Heat Exhaustion at a Cross Country meet. Other parents helped out tremendously to try to help her recover and get her home! I took her to the Em ergency Room and she needed a couple of liters of IV fluid to bring her around. We had angels working double duty I tell you! I decided to make a card using the MoJo Monday Sketch, and a generic card as well. The cards are stamped with a technique junkies technique called Depth of Field. The school colors are orange and black. 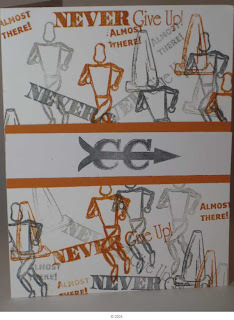 for Cross Country rubber stamps- and she has not one, but two sets of CC stamps in her store! 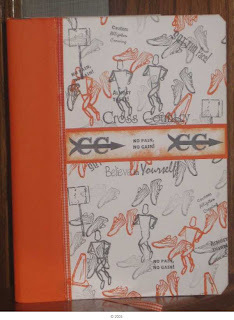 Finally, I am also attaching a Journal I made for my youngest for her second CC season (she played Soccer Freshman year before 'converting'). Reminder on the Blog Hop - It's Almost Here! This Friday, beginning at 8:00 am the FCD Blog Hop will get under way! This is the new Design Team's first hop, so be sure to come and join all the fun! 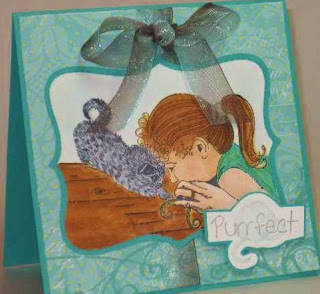 We look forward to having you visit, catch a look at the cards made with Pamela's awesome stamps and continuing on to the next "hop" in the hopes of winning a prize! Mark your calendars, set you computer to remind you and hop on in!! 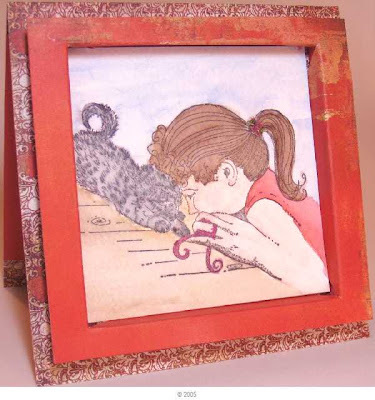 There is a place on Firecracker designs by Pamela under Gallery where there are some Sketch Challenges posted. 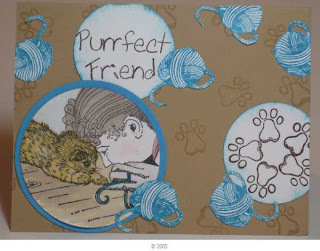 I was trying to visualize which one would work for my girl and her kitty, and I picked the sketch posted above my card. So, this is my take on her card. What do you think? Her gallery is so fabulous, I have to try to make another card this week. Bloggers Challenge "Thinking of You"
The theme for this weeks blogger challenge is Thinking of You. 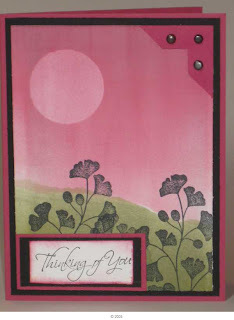 I made a card using the brayer in a Zindorf Spinoff called Scene Silhouette from the TJ newsletter. I was able to 'play' with stamps at an open house on Thursday, and got to use this set from the SU catalog- I used a piece of paper ripped in half kind of at an angle.....brayered on color- in a Zindorfian manner......the first color I used is Pretty in Pink, then Rose Red. For the bottom, use the other half of the ripped paper and I beayered on mellow Moss and Old Olive. I added the sentiment in white for a stark difference, and added the corner and brads on the top for balance. Su Paper is Rose Red, Black and Whisper White. Tip: when brayering or sponging on color , you want the color to move on top of the paper so it blends well. Use only coated paper like SU Whisper White. Papers like Georgia Pacific and watercolor paper soak in the color, so you loose the smooth look - it will look blotchy (save the Georgia pacific for your Copic cards!). Please check my post from yesterday- there is a link for a little girl that was very badly injured in an accident-her name is Paige- please join in and send her a card if you would! I wanted to make a sweet card for the little girl in the following post to satisfy the Sweet Dreamers Share a Hug challenge. 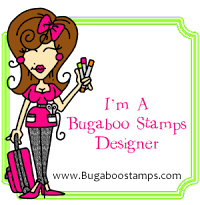 My stamp set that I will be showcasing for Firecracker Designs by Pamela is a very sweet set and just perfect for this challenge. 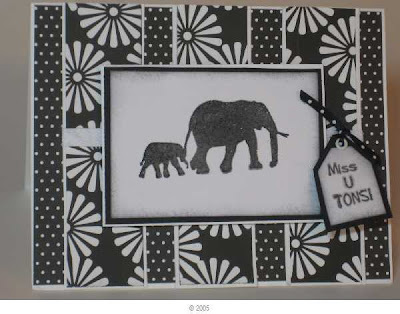 I set out to make a card that a little girl would love- I stamped the image, cut it out using the Stampin Up Big Shot Die called the Top Die Note, cut around the perforated edges and cut out a coordinating paper to mat it. I found the DP first- and some glorious Organdy ribbon at Archivers to coordinate with the design. I started with her sweet face first. I used Copic markers: E000, E00, E11, R20. Next, I colored her hair Y21, E31, E33, E35, E37. I colored the floor with Copics E59, E25, E99, E33, E53-in that order, and then went on to blend it until it looked pleasing to the eye. For the sentiment, I used Gray SU ink and overstamped the yarn with Soft Sky. 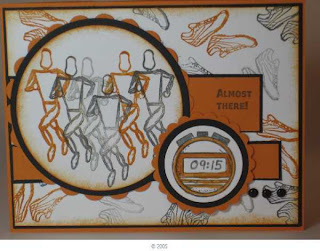 The image and sentiment are outlined with bermuda Bay CS from SU. I added Shimmerz in Angel Wings to her hair tie and to the yarn. I hope you enjoy this sweet card. I want to share with you the story of the little girl I made this card for- maybe you will consider sending her a card as well? If you send a card to Paige, make sure to link your blog post on Erin's blog. She has some fabulous blog candy up for grabs! I think I will send along something for her to add to her blog candy- because I think this is a fabulous project! All of the stamps shown above are only $8.99! I am working on moving all of my stamping supplies to my sewing room in the basement- quite an undertaking! 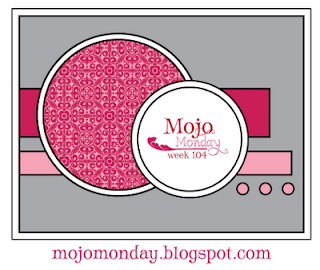 But, I took some time to make a card for the MoJo Monday sketch challenge- my first time participating! The Stamps are by Firecracker Designs by Pamela, you can see the set I used here. 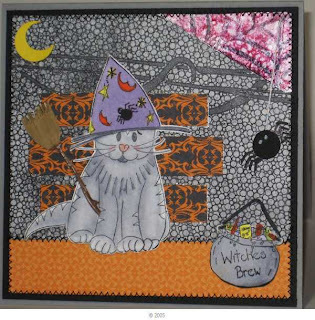 I used DP by Stampin Up and flipped the sketch so I could use this Halloween Kitty. I colored the Kitty with Copic markers, as the Caulderon with all of the Witches Brew............anf the broom. The Moon is made by punching a 3/4 inch circle, and then punching a 1/2 inch circle out of that. The spider is also a circle punch. His web is a Technique junkies Technique called AI Foil. The Zig Zag around the edges is done on my sewing machine. There is also a touch of glitter around the BG strips with a Sakura Gelly Pen, and a few drops of stickles on the Spiders 'string' he is hanging from. I have a niece that loves Kitty cats- I'll have to send her this card and a little treat! I spent most of the day working on new shelving for my stamps down in my sewing room....sadly (for my family) my stamping supplies have overtaken my kitchen pantry..... So, I did not get to stamp. I wanted to post my Sweet dreamers challenge that is due today before I head out to a friends for the evening. 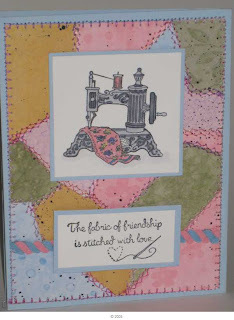 Well, a sewing machine does have a motor....and I thought since it is national Sewing Month it would be an appropriate theme for this card. Colored with SU markers and Copics. The trim is Ric Rac in blue and pink intertwined. I also set up a faux Infinity Board described on Keri Serika's blog- Thanks to Pamela from Firecracker Designs by Pamela for posting this link on her blog , and set up my Ott light for taking the picture. Since i am new to blogging, I am always looking for tips! 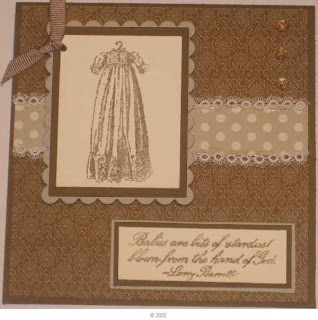 For the Bloggers Challenge this week, we were to create a baby card......I have a (retired) SU set that I just adore-being that I have done some heirloom sewing in the past, the Christening gown is just so pretty..... It is called Buggies and Booties. 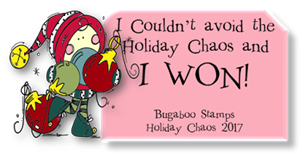 I stamped the image and the sentiment by first coloring the stamp with the Sahara Sand marker, then with Close to Cocoa. I stamped both images on Very Vanilla (SU) cardstock. The DP is Thoroughly Modern (SU) and the strip in the center is the flipside of the page on the front of the card. I added some baby tatting lace, dew drops and framed the image with Nestabilities in Sahara Sand and Soft Suede CS (SU). The ribbon is also retired SU. Marker Watercolor and Liquid Glitter!!! I am on the Non-Demo side of the Late Night Stampers yahoo Group. The owner, Sherrill put out a challenge for a technique she developed with SU reinkers and a liquid medium, and it is applied like Polished Stone. So, I went about making a number of these backgrounds- this one was done with So Saffron and Apricot Appeal if my memory serves me correctly. I do not usually craft with too much yellow, but this begged for a flower and some Blue...... So, I used a Su set called Bloomin Beautiful- stamped in black ink on Shimmery White SU CS, and used the marker Watercolor technique. I recently saw a 'new release' announcement through the TJ yahoo group which I belong to for new sets by Firecracker Designs by Pamela. I just LOVE these Elephant stamps, so immediately had to order them. I saw a post by the owner for a new Design Team, so ordered a couple more sets from my Wish List and made 5 cards and submitted them. OH MY STARS!!! I have been chosen! For the next 6 months, I will be on a Design Team for Firecracker Designs by Pamela. (She is a sponser for the Technique Junkies ). This card I made using skills learned from Michelle Zindorf at a workshop last year here in my hometown of Wheaton, Illinois (and she is coming back next May). The embossing used on the card makes it an Advanced Brayering class. First I loaded the stamps with Versamark, and I colored them with markers. I stamped the images on the card stock and covered them with clear EP. Next, I punched out a circle for the sun out of a post it note, making sure the sticky was included in the circle. I lightly brayered on some color-Soft Sky on top and Creamy Carmel on the bottom. Next, I sponged on color so the colors went right where I wanted them. Michelle has advised all of her students to buy cheap sponges at the dollar store- peel of the green scrubber side and cut them into smaller squares. They really do sponge the ink on so much better than the sponges I had previously used. I sponged Baja Breeze and Blue Bayou on the top, and Close to Cocoa on the bottom to make shadows. Once I was happy with the ink placement, I took a post it note and sponged the Baja Breeze down the side of it around the sun. I love the Elelphant set- it is very realistic-real life nature set and if you are so inclined to take a look at it here -what do you think?? There was also a new horse set released too...it was very hard to choose between the two, but I am happy I chose the elephants. If you look on my sidebar, you will see a link to Michelle Zindorf's blog. She has step by step tutorials for over 200 cards with visuals. Have a great day-Happy September to you all!